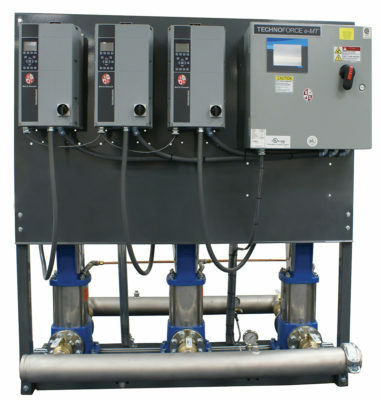 The TechnoForce e-MT variable speed packaged pressure boosters are pre-fabricated and designed for maintaining a constant clean water delivery pressure. The pumps and the UL-508A listed pump logic control panel are manufactured by Xylem. Certified and listed by UL-QCZJ – Packaged Pumping Systems, the package is also independently certified to NSF/ANSI 61 for potable drinking water. The TechnoForce e-MT are pre-configured for 2-4 pumps and capable of 2100 GPM and 300 psi. The PLC is capable of supporting up to 6 pumps. Three (3) pump options: e-SV multi-stage vertical pumps, and NPE or SSH end suction pumps. Individual fused disconnect switches are provided for each variable speed drive to support partial-to-full flow operation during times of servicing. Other features include a 5.7” color touch screen interface, lead/lag alternation, no-flow shutdown, trending log, a redundant pressure transducer (optional), and thermal purge.